Ever since moving from a one-bedroom apartment in Queens to a three-bedroom apartment in Mexico City (with far, far more space in all the rooms) we’ve felt a bit like our old furniture was sized for a dollhouse. Our tiny dining room table looks like a mere end table now. But most pitiful was my home office set-up. Namely, I didn’t really have one. We started to pull chairs from our dining room to serve as desk space. So, a couple of weeks ago we ventured to a huge furniture market in the southern portion of Mexico City and bought a new desk for me, a cabinet, two side tables and a large room divider. I decided to move my office out of our dark third bedroom and into our extremely sunny dining room. This weekend we plan to paint the apartment, and I still need to get a real office chair, and set up our desktop computer and printer out there. Poco a poco, the apartment is coming together. Padre Island near Corpus Christi, Texas, was once a peaceful, quiet place…. OK, it’s still pretty sleepy — as far as tourist destinations go — but it’s added a few super tacky souvenir shops in the last few years. Above, you see my new blog banner. Tacky, tacky, tacky. My brother and I traveled to the Aransas Pass National Wildlife Refuge today. It was perfect — cool, crisp and full of animals. First there were the ‘gators. Two small ones and one (shown above) that could be used to tow heavy cargo. These are wild, untamed reptiles, folks. Not a zoo. We were just a few feet away, across a small body of water, when we spotted them. Thank god for telephoto lenses. We also saw two snakes, thousands of birds, deer, hogs, javelinas and two bobcats. The bobcats were, of course, too shy to allow photography. And the javelinas had their faces shoved in the dirt, eating. But here’s some pretty good shots, from both me and mi hermano, Erik. In Corpus Christi, Texas – aka the Sparkling City by the Sea – for Navidad. The town prides itself on its silver production and jewelry designs. It also seemed deeply religious when we visited during the Dia de Guadalupe holiday. Residents trekked to a hillside church, with the little boys dressed as Juan Diego Cuauhtlatoatzin, and the little girls decked out in Virgen de Guadalupe outfits. (The holiday commemorates the day in 1531 when Juan, an Aztec convert to Catholicism, saw an apparition of a dark-skinned virgin during a stroll north of Mexico City.) In modern times, unfortunately, the celebration includes ’round-the-clock fireworks. After tomorrow, I am unplugging myself from the internets to do a little traveling with mi esposo y perro. 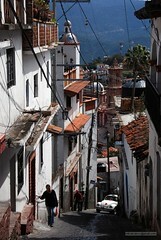 Vamos a ir a Taxco por cuatros dias. I’m looking forward to the fresh air. Las casas en Colonia Roma – que bonita, no? Along with this juicy papaya from Chiapas, I bought a coconut, cantaloupe, limes and bananas. The produce here is exceptionally fresh, since it’s all grown nearby. Year-round. But, there’s just two of us, and the dog. So, what the hell did I do with all this produce? This weekend, while I was busy eating tamales and sipping tepache, one of our local volcanoes, Popocatépetl, decided to have a little fun, too. This is also QUITE the photo. I’m not sure if it’s a good or a bad thing that I can’t see the volcanoes (because one is not enough fun, we have two nearby) from my apartment. On one hand, how frackin’ cool: I live amongst volcanoes. This sort of answers my question about where all the dust comes from. Doh. Flickr photographer Arareko just happened to climb El Popo during the eruption. See his full series of photos here. Yesterday, along with eating an extraordinary amount of tamales (including pineapple-stuffed tamales) at La Flor de Lis — a restaurant that’s located only two tempting blocks from our apartment — Brendan and I tried two ancient drinks, tepache and pulque. I had tepache with my tamale meal. 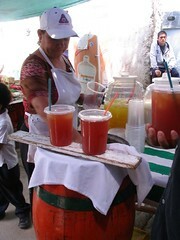 It’s a dark yellow-orange liquid, shown above in the photo, sold in some restaurants and many mercados, as an agua fresca. Technically, though, it’s not that fresh, since it’s fermented pineapple juice. According to Wikipedia, because it is so easy to make, it’s popular with Mexican inmates, who can make it in their cell. If you’d like to make it yourself, here’s two recipes: Tepache 1 and Tepache 2 (includes photos). To me, it didn’t taste much like pineapples (a favorite flavor and fruit of mine), but was still quite sweet and tasty. It has a little alcohol in it, too, never a bad thing on a Saturday afternoon. I’d definitely order it again. 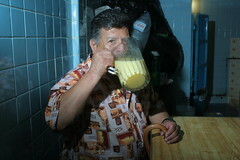 And, later last night, Brendan ventured off to a pulqueria to try the famed drink of the Aztecs, pulque. It is made from fermented maguey (a type of agave, the same thing tequila is made from). Women traditionally weren’t allowed in pulquerias, but Brendan reports that the one he visited in downtown Mexico City was mostly filled with local college students and a few tourists, somewhat diminishing the once-very-masculine ritual of drinking pulque. 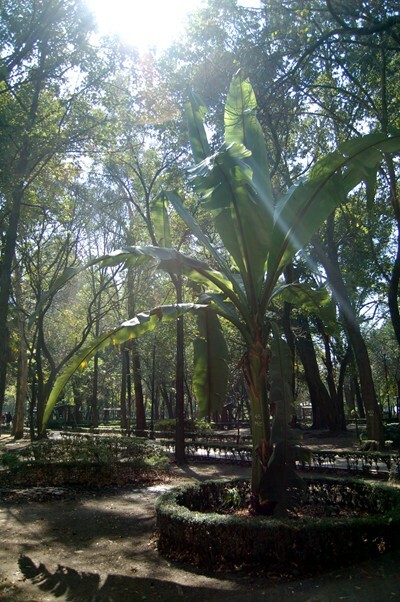 The history of pulque in Mexico is extensive and could be its own book. Let’s just say that Brendan’s assessment of the drink was that the “flavor was OK, but the texture was like mucous.” (Similar to when you break off an aloe vera stem, and it’s all goopy and sticky. Ick). I can’t provide you with any recipes, unless you have one of these growing in your garden.